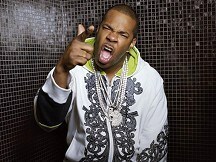 Busta Rhymes' upcoming album will feature "great things", he has said. The nine-time Grammy-nominated rapper, who has been busy working on his ninth album ELE 2, revealed he has a soft spot in his heart for the follow-up to 1998's ELE (Extinction Level Event): The Final World Front. "It's definitely a very special project. I haven't been this excited about an album in a long time so you have a lot of great things to look forward to with this album as we get closer to the release date," he said. Busta - who is headlining the One Love Peace festival at Wembley Arena on July 31, alongside Shaggy and Sean Paul - assured fans will be satisfied with the final result. "I haven't scheduled a date yet for the album, but it should probably be coming around October or November time," he continued. "I have to say I am about 85 to 90 per cent done with it. You're going to hear some singles and see some videos, and we shall keep people informed, so stay tuned." The Kings of Leon are promising to make it up to their Dallas fans after cancelling a show because their lead singer complained it was too hot to perform. Amy Winehouse's Grammy award-winning album Back To Black has soared to the top of the charts in the wake of her death. Biffy Clyro frontman Simon Neil has said having their track covered by X Factor winner Matt Cardle hasn't made much difference to the band. Adele is set to make her first appearance at the MTV Video Music Awards, while Chris Brown and Lil Wayne are also returning to the stage.